- Enhance your living space for harmony, peace and success. Feng Shui is the ancient knowledge of creating ideal living spaces. It translates as "Wind and Water", which refers to the intangible aspects of a place or a space's atmosphere. Feng Shui is the ancient knowledge of the Earth and the influence it has on its inhabitants. The goal of Feng Shui is to live in harmony with the energies that surround us and to create an environment that fulfils our needs and supports our development in every aspect of life. A subtle energy flows in the meridians of Earth and our bodies. This energy is called Qi. It is the energy that gives life and creates health and abundance in nature. Qi flows in landscapes as well as in buildings. Everything is connected to this flow of energy. The quality and quantity of Qi in the spaces that we live in constantly influence our energy level and zest for life. 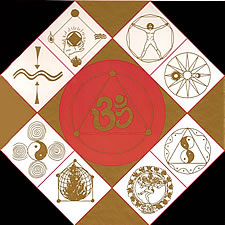 Like an organism, the atmosphere of each place and each building is shaped by the quality of the Qi flow. Where the life energy flows freely, health and happiness of the inhabitants are supported. Where the flow of energy is hindered or blocked, stagnation occurs and with it feelings of low energy and physical and emotional discomfort. This may even lead to physical symptoms or depression. Also professional projects, in spite of great effort, remain unsuccessful when the flow of Qi is restricted. Where do the energies come from that weaken and imbalance us? It can be the energetic heritage of the space. The past leaves energetic imprints in walls, ceilings, floors and furniture. Also electro-magnetic fields from power lines, electrical appliances and wireless devices can contribute to the problem. Subterranean waterlines and toxic fields in the Earth can also create an unhealthy flow of energy. A busy intersection as well as an aggressive neighbour can have toxic effects on our well-being. An Alpha Chi Consultant is able to analyse the existing flow of energy, thereby recognising the specific qualities of a location. In order to optimise the use of a place, all energies that interfere with your well-being will be dissolved. Supporting energies will be strengthened and guided to where they benefit you the most. You could compare Energy Feng Shui to acupuncture. Like needles, small energetically active Feng Shui symbols are placed around the place, which will restore a harmonious flow of Qi. Energy Feng Shui noticeably changes and improves the atmosphere without affecting the decorations or general design of a place. Living and working areas are created that allow everybody to feel good. In a business environment a better atmosphere for employees and customers is being established, which leads to success and added income. Feng Shui creates places of harmony and power that immerse the inhabitants in a constant flow of life energy. Places like this enable us to find new perspectives and support us in implementing our own visions on how to create a fulfilled life. With Feng Shui you can create offices, in which efficient teamwork is possible as well as living spaces, which offer a harmonious surrounding for families to relax and recharge. You can create gardens that give you a retreat from your daily life and revitalise you. Feng Shui creates places of harmony, balance and empowerment. During the planning stages of a construction project your Feng Shui consultant can help you make the right choices. With the knowledge of the natural laws of energy flow, it is possible to determine the best property, cleanse the site energetically and plan the best possible array of rooms and their usage. The use of light and colour as well as materials play a role, also the understanding and observation of the 5 elements - fire, earth, metal, water and wood. Understanding how to balance these elements is the key to creating healthy environments. The price for a Feng Shui consultation depends on the square footage and the complexity of the project.